This coming Sunday marks the centenary of one of WWI’s most infamous campaigns: Gallipoli. It was an audacious attempt by the Entente to break the European deadlock with a master stroke. Instead, it quickly turned into a hellish ordeal and a resounding defeat. Here’s why Gallipoli seemed like a good idea at the time – and why it was doomed to fail. That “elsewhere,” argued Winston Churchill, the First Lord of the Admiralty, should be far away from Europe. He, along with many of his colleagues, became enamored with the idea that a strike at the heart of the Ottoman Empire through the Aegean Sea could dramatically alter the complexion of the war, if not win it outright. Hindsight being what it is, it’s easy to dismiss Churchill’s grand plan as fanciful thinking. But at this stage in the war, many military thinkers were reluctant to acknowledge the supremacy of the defense and the resulting onset of attritional warfare, and remained convinced that a single, decisive battle could win the war. But not everyone on the allied side perceived the creation of a new front as a good idea; within the British War Council itself, both Lord Kitchener and First Sea Lord Jackie Fisher harbored concerns. The French, headed by a very skeptical General Joseph Joffre, worried about what an entirely new front would mean. To them, the Western Front was the primary — if not the exclusive — theatre of operations; anything else would serve as a distraction and a drain on precious resources. But after the British War Council finally agreed to go with the plan, the French decided to tag along as well for fear of being left behind on such a potentially important and prestigious campaign. 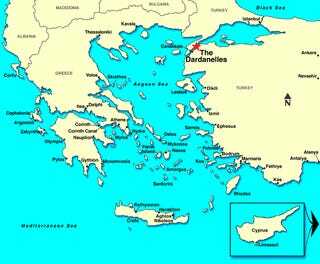 Geographically, the Dardanelles served as the gateway to Constantinople, which resided at Turkey’s northwestern tip. Over 170 miles (275 miles) long, and only a few miles wide at its narrowest parts, the channel was protected by an array of forts, guns, and sea mines, the beneficiary of German assistance that made it well prepared for an anticipated attack. The Gallioli Peninsula is a strip of land situated at the opening of the Dardanelles. The area is arid, hilly, and full of steep ridges. As a place to launch an amphibious landing, it’s far from ideal. But from its highest peaks virtually everything below is visible; its elevated perspective offered a tantalizing and invaluable position from which attacks could be launched. British War planners assumed that an amphibious landing here would be relatively easy. 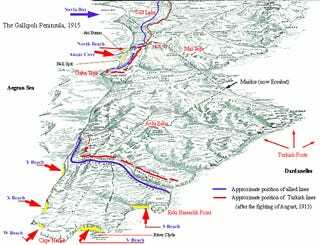 Once established at Gallipoli, the plan was to have the troops continue along the straits and make their way to the Ottoman capital. The Turks were fully expecting an attack, but they weren’t sure where or when it would commence. Already short of men, this forced Sanders to spread his 84,000 men thinly along the 100-mile long peninsula. To compensate, he allocated a sizeable portion of his troops — an entire division out of the six — as reinforcements. In charge of this force was Mustafa Kemal, who would go on to become the future Ataturk after the war. Once it was known where the invasion was happening, these back-up troops would be quickly dispatched to help. The invading force consisted of 200 transport ships, 18 battleships, 12 cruisers, 29 destroyers, and eight submarines. 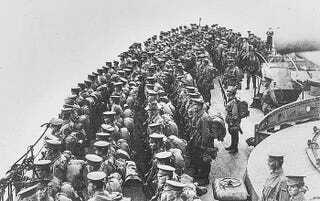 On the transports were 27,000 British soldiers (including the elite 29th Division), 30,000 Anzac troops consisting of Australians and New Zealanders, and 16,000 Frenchmen. In addition to the flotilla guns, there was a generous supply of artillery. On the downside, however, and in addition to facing an uphill battle (both literally and figuratively), the troops were short on grenades and trench mortars — a deficiency that, given the landscape, would prove disasterous. Once the invasion started, it quickly became apparent that the hills were impossibly steep and the lines of fire terribly inadequate. Hamilton’s plan would see his force divided and sent to three different locations. The French were sent to Kum Kale as a diversion, while the British were dispatched to five separate beaches at Cape Helles — the “toe” of the peninsula. The Anzac troops were set ashore in the north at a point called Gaba Tepe. I don’t order you to attack. I order you to die. In the time which passes until we die, other troops and commanders can take our place. As noted by historian G. J. Meyer in A World Undone, “Gallipoli was turning into something almost worse than outright defeat: a stalemate as tightly locked as the one on the Western Front.” Ironically, the effort to break the European deadlock had resulted in the creation of another. Gallipoli was turning into a siege war. By early May, the British and French had endured 20,000 casualties, and with no reserves in sight. Adding insult to injury, German submarines sank two ships later that month. In response, Britain recalled all capital ships to port; only destroyers with 4-inch guns remained to support land operations. Many factors contributed to making the Gallipoli battlefield an almost unendurable place for all soldiers. The constant noise, cramped unsanitary conditions, disease, stenches, daily death of comrades, terrible food, lack of rest and thirst all contributed to the most grueling conditions. In one incident reminiscent of the 1914 Christmas Truce, a brief armistice was declared so that troops could collect the dead in No Man’s Land. It offered an opportunity for the soldiers on both sides to exchange words and gifts. Bodies were tossed into mass graves, but because real estate was limited, it was difficult to conceal them all. The remains of dead soldiers were stuffed under the floorboards, and body parts were known to extrude from the trench walls. Newly arrived troops were horrified. The evacuation itself was very well executed, the result of excellent planning and clever feats of deception. In order to prevent the Turks from realizing that an evacuation was taking place, automated rifles were set up with timers — in the form of water catchments — to intermittently fire shots. The final phase of the evacuation was completed within three days, and with minimal loss of life. The Gallipoli campaign...was doomed from the start. Planning was a matter of wishful thinking, if not outright fantasy. No serious attempt was made to understand the strength of the Turkish army, the nature of the terrain or the numbers of Allied troops. Nor could anyone conceive of logistical support required to make a success of the operation. “Thanks to political interference, lethally combined with the bullish optimism of generals who saw only opportunities, the Gallipoli campaign was launched into a void that guaranteed failure.” The Western Front was the place where the war would be won; Gallipoli was merely “a futile and costly sideshow”, exacerbated by “lunatic persistence in the face of the obvious”. Wherever right lies the blame for the improvident, halting, blundering, irresolute conduct of the Gallipoli expedition, a large share of responsibility must rest upon the British Cabinet. Either they should have put aside the project entirely, or they should have given it adequate support. From first to last they appear hardly to have known their own minds in the matter and so continued to hesitate and delay that their program throughout was ‘tentative and piecemeal,’ of the sort that Sir Ian Hamilton had indicated “was bound to lead to disaster. But even in this assessment the authors are being too kind; it’s not immediately obvious that the plan, under any incarnation, could have succeeded. The resource-strapped Entente was pre-occupied with the Western Front, and already dealing with munitions shortages. What’s more, it simply could not compete with the Ottoman Empire’s vastly superior internal lines of communications. And perhaps most scathingly, the Entente grossly underestimated Turkish fighting strength and resolve. In Australia, the battle of Gallipoli represented its coming of age as a nation, a sentiment fueled by the reporting of C. E. W Bean who witnessed much of the goings on during the campaign. It’s important to point out that the Australians lost far more soldiers at the Battle of the Somme, yet it’s the tragedy of Gallipoli that’s remembered.